SURPLUS PROPERTY SOFTWARE combines all the best practices of surplus property disposal management in one easy-to-use, industry-standard program. The web-based Surplus Property Software management application has been continuously refined through our consultations with over 780 U.S. institutions that dispose of surplus property. Originally developed for universities and education institutions such as colleges, schools, and school districts, the application is also available to surplus operations run by state, county and local government entities including municipalities. The application not only provides a full audit trail of asset recovery and surplus property disposals, but is also proven to significantly save time and money in the process through automation and workflow management. In addition, real-time online auction features increase market presence and sales, creating a vital new part of an institution’s revenue. 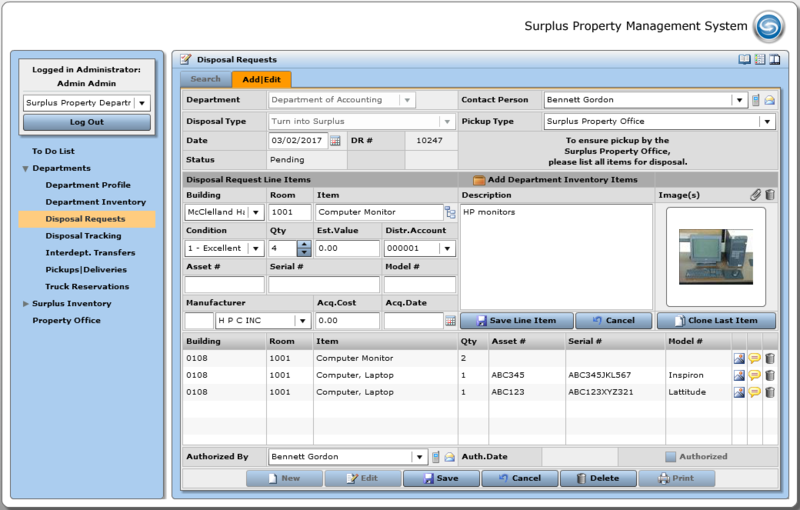 Surplus Property Software provides intuitive forms to make it easy for departments to submit disposal requests. 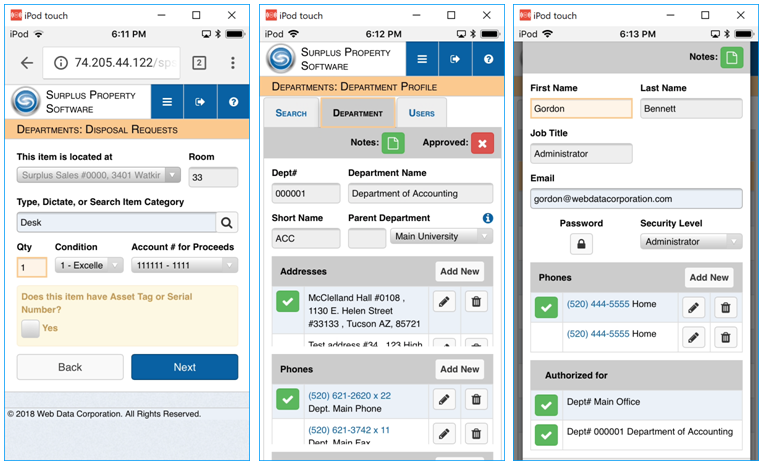 Data entry forms include built-in “how to” videos, so department users can self-train. Items with asset tag or serial numbers can be validated against your asset management database to verify that the property qualifies for disposal and that it belongs to the department making the request. After a disposal request is completed, the system automatically notifies the necessary individual to approve the request. NEW! Disposal Requests are now Mobile! Department users are no longer tethered to their PC or Mac to create disposal requests. With the new mobile disposal requests they can do everything from a smart phone or tablet, including uploading images from mobile devices while listing items for disposal. The new approval process allows authorized users to approve Disposal requests directly from an email. Items approved for disposal are listed in the Pickups/Deliveries screen and can be grouped geographically for pickup by the selected truck. Items are easily added to the manifest for a selected truck. Multiple daily manifests can be created for any date in the future. Manifests have a barcode for each item to be picked up. These barcodes ensure that items are easily identified with a wireless scanning device during receiving. NEW! Pickups and Deliveries are now Mobile! They can be recorded with any tablet or smartphone, and there is amazing flexibility to edit items and upload images during the pickup process. Department staff sign the device’s screen to confirm pickups and deliveries, adding more detail to the audit trail for asset disposals. Items received are logged through a web-based screen or with a wireless scanning device on the warehouse floor. Warehouse staff enter the quantities received, assign sales categories, can assign items to existing inventory groups, split groups of items into separate inventory records, set prices, enter costs that will be charged back to the disposing department, assign items to a warehouse location, and slate unusable items for recycle of trash. Items received are assigned inventory labels with unique, sequential inventory numbers. Items not received remain in the delivery schedule until they are picked up, or until they are deleted from the system. 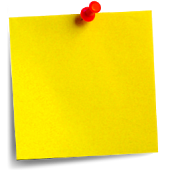 Deleted items are noted in the original disposal request, creating an audit trail. NEW! Receiving is now Mobile! It can be done quickly without the need for a scanner. All of the standard item-editing features are present, including uploading images, assigning to pallets, and more detailed and flexible splitting of quantities. The application provides tools for surplus property re-use by enabling departments to easily find items they need from existing inventory and to create want a list of needed items. Departments may temporarily reserve items and be notified by email when a matching item becomes available. The application also provides an email brochure creator that allows surplus property departments to easily create HTML brochures to send to interested parties. NEW! Property Reuse is an essential money saving process for all surplus property departments. Our new "Want List" module is now available on all mobile devices. Together with the targeted emailing of promotional brochures and the "Needed Items" listings, your surplus property department can have the most efficient process for property reuse. The application provides retail point of sale (POS) capabilities for selling items to departments, the public, or to other institutions. Full online auction capabilities are also included, supporting online participation in live and/or simulcast, auctioneer-led events, as well as sealed-bid auctions, and standard online auctions. Photos of the lots can automatically be uploaded and assigned to respective lot numbers instantaneously. Bidders register online and can pay outstanding balances via check, money-order, cash, or credit-card (processed through the application online). The system produces a commission report that automatically calculates the surplus property office commissions based upon any preset schedule. When the commissions are finalized, the journal entry report can be generated. The JE report shows the debit account from which funds will be distributed, and the credit accounts into which funds will be transferred. This report can be printed to show details, and is exported in a file format that can be imported directly into any financial services application.